Three years ago, the managing partner at Midwest Orthopaedics asked me to be the captain of the Rush and Midwest Orthopaedics team for the Swim Across America Chicago Open Water Swim. Midwest Orthopaedics is an ongoing sponsor of the event, which has raised funds for cancer research at Rush since 2012. I am very familiar with the swimming community — my daughter Morgan graduated from Michigan State University and swam there for four years, as well as four years at Downers Grove North High School. During that time, I was at almost all of Morgan’s swim events. What’s more, I am a nurse practitioner in orthopedic oncology, so there was a logical connection. It made sense for me to be involved with the Swim Across America Chicago event, but I’ll admit that I barely swim in a pool, let alone in Lake Michigan. But, of course, I became Captain Patty. Luckily for me, the swim is a noncompetitive race — no triathlon clawing or scratching — and the half-mile swim parallels the beach, which means the water is shallow and makes the race doable for all skill levels. For those more proficient swimmers, you can swim up to three miles. It is way easier than any chemotherapy treatment, any radiation treatment, or any surgical procedure and rehabilitation that my cancer patients have gone through. We even have former cancer patients on the team. This year there is an 11-year-old boy on the Rush team who is swimming because he doesn’t know anyone with cancer and wants to keep it that way. What a way to motivate yourself to push through your swim. Olympic swimmers are involved in the event, swim next to you, cheer and hug you when you exit the not-too-chilly lake. The Olympians even visit the pediatric unit at Rush before the event and let the patients hold their Olympic medals. Even the isolation patients get a visit — the Olympic medals come into their room in a plastic ziploc bag. The smiles on both the patients’ and Olympic swimmers’ faces are contagious. Likewise, the support on the beach makes everyone smile — former patients and families, Rush employees, Dr. Larry Goodman, Dr. Josh Jacobs, Dr. Steven Gitelis, Dr. Steve Bines, Dr. Chris Coogan and many more have come out to the event to be cheerleaders for all the other teams. I am especially proud to be involved in the race because one of the sarcoma researchers, Dr. Carl Maki, received a grant from the funds raised from the 2013 swim. Right now Dr. Maki is leading a team to understand how osteosarcoma cells lose their responsiveness to chemotherapy. This research may help treatment approaches in the future. Osteosarcoma is one of the cancers that my patients, whom I’ve treated for 30 years, get diagnosed with. This is the cancer that some of my teammates on the Rush/Midwest Orthopaedics team have been treated for. This is the cancer that my friend, a pediatric oncologist and swim teammate, treats every day. This is the one of the cancers that my patients get harsh treatments for and, sometimes, don’t survive. Swim Across America Chicago is personal to me. 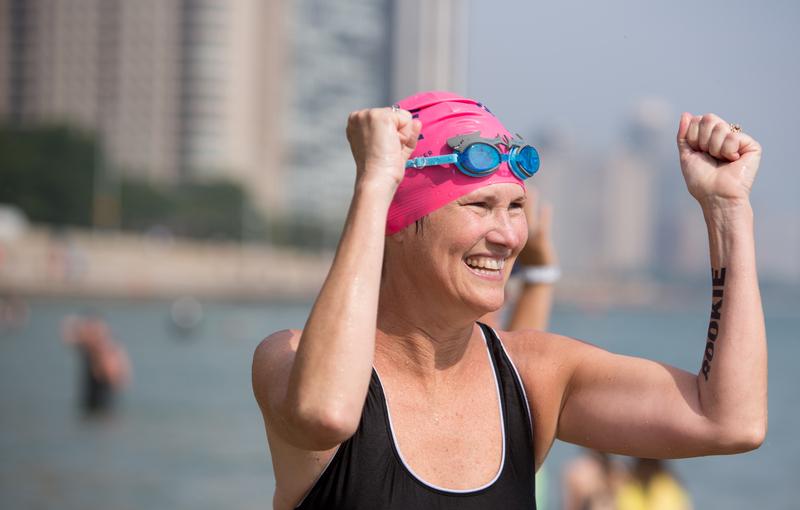 Come to Lake Michigan on Saturday, July 26, 2014, to help us drown cancer. Sign up online for the Rush University Medical Center and Midwest Orthopaedics at Rush team. I would love if you joined us. If you are a non-swimmer, sign up as a volunteer or just come and cheer us on. And please consider donating. Cancer researchers help us all, so let’s help fundraise for their research. This entry was posted in Cancer, Nursing, Orthopedics and Sports Medicine and tagged cancer research, Swim Across America. Bookmark the permalink. Great story about Patty and the Swim Across America event this weekend that she and Morgan are involved in. How exciting! What a cool way to raise money and awareness for cancer research! Very proud of the selfless people participate in this event, extra proud of my sister-in-law Captain Patti and my niece Morgan Piasecki .enjoy your day and have a great swim!